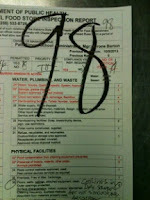 Our first inspection does not get a score since it is the first time to be permitted. An inspection is done and you get a food permit and a paper like this one with no score on it. Then within 30 days they come back to give you a 'scored' inspection. During this time they will look at everything they asked you to do, or suggested that you improve, change, or fix. We lost 2 points on a ceiling in our pantry/stores that was textured. It has to be smooth and non absorbent. We were given 4 months to fix it but you still get counted off until its done. What happens if it never gets done? I don't know, and won't be finding out! We had it scheduled to be done last Monday which was unfortunately 3 days AFTER she came back. So we probably would have gotten a 100! But, no matter...we did a great job and she was complimentary of our attentiveness for getting things done and keeping them clean. Just like an awards ceremony I would like to thank a couple of people: Pastor Will (P-Dub) and Sous Chef Roberto (Robert B.)! Job well done! P-Dub did most of the maintenance that was involved, or arranged for it to be done. Sous Chef Roberto is...well, he's my sous chef. SO you know I give him the grunt work! LOL!